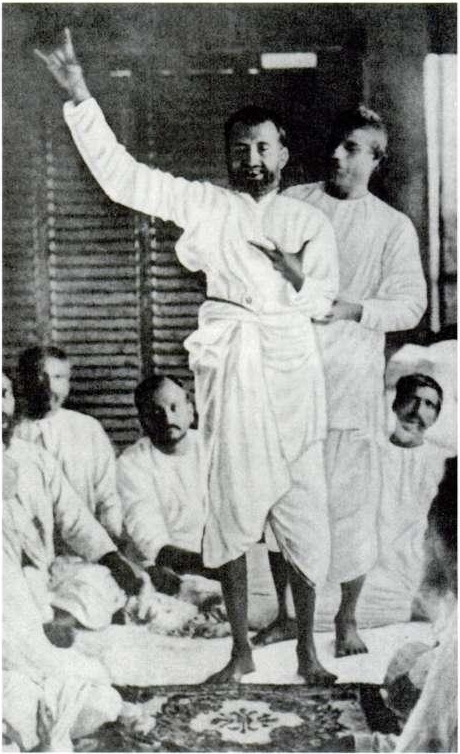 "Ramakrishna in bhava samadhi at the house of Keshab Chandra Sen. He is seen supported by his nephew Hriday and surrounded by brahmo devotees." Can any scholar here, identify this hand Mudra done by Ramakrishna Paramhans by his right hand and its importance in Yog and Samadhi? The same Mudra can be seen in Lord Shiva's left middle hand as well.Is it superior to Gyan Mudra for Samadhi? dhaayet nityam mahesham rajatagirinivam chaaru-chandra-avatamsham/ ratna-aakalpa-ujjvalangam prasu-mriga-vara-abhiti hastam prasannam/padma-aasinam samantaat stutam amarganair bhyaghrakrittim vasanam/vishvadyam visvavijam bhavabhayaharam panchavaktram trinetram --Reference :Stavakusumanjali,Udbodhan. Normally mind is compared with a running deer and this mudra signifies keeping the mind still in case of Lord Shiva, as He holds parashu (axe) in other hand that signifies slaying the deer ie calming the mind. 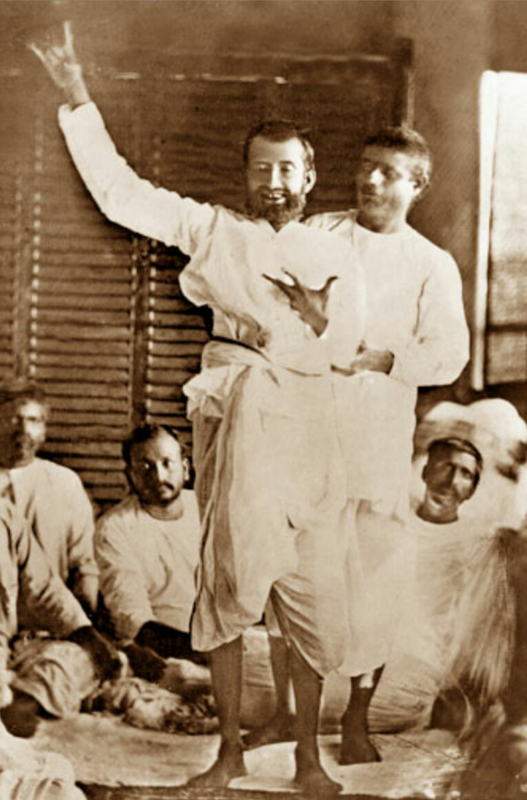 But Sri Ramakrishna so far as I know did not use any such mudra intentionally.All was the effect of divine ecstacy.But it looks like Mriga-Mudra. 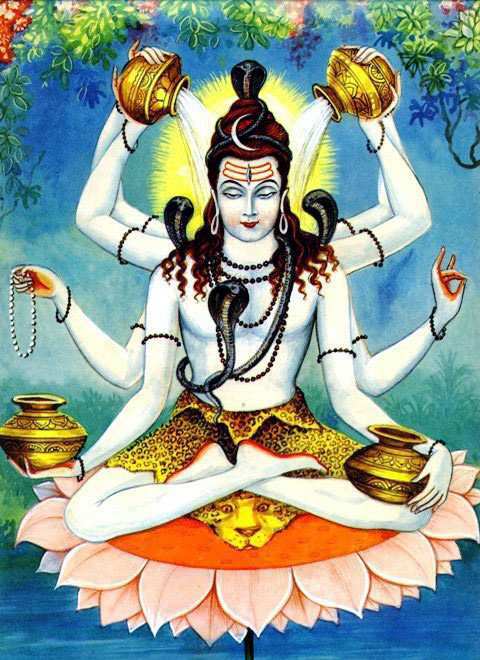 The question of superiority or inferiority does not aruse by the way,Only Lord Shiva, known as the Pasupati (Mriga is a Pashu) has Mriga-Mudra in His hand. The image enclosed by you is a retouched one.I am enclosing a copy of the original for your perusal. Apana mudra, also called as the purification mudra, is a hand gesture that detoxifies and purifies the body and balances the elements of space and earth within it. It eliminates waste, toxins and chemicals in the body and prevents deseases and illnesses.Apana mudra is performed by bending the middle finger, the ring finger and the thumb so that the tips of these fingers are touching. 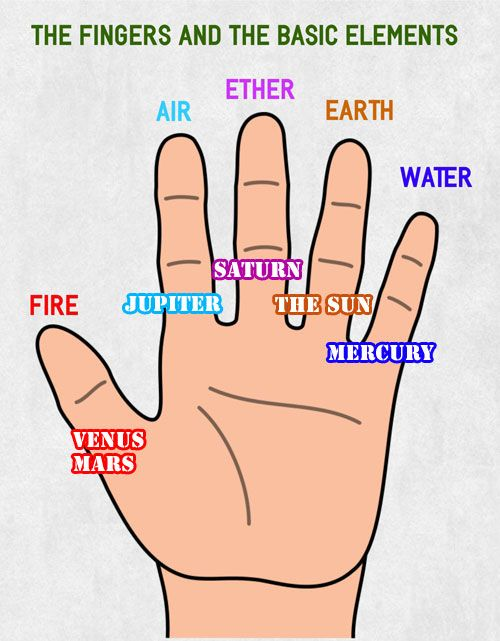 The index finger and little finger remain straight. This mudra is usually practiced with both hands. Apana mudra increases the vata and kapha doshas in the body and decreases the pitta, thus helping to balance the three doshas in the human body.It is best to practice this mudra in the mornings. People with vata and kapha constitution should practice this mudra in moderation. While Gyan mudra, or chin mudra, often used while meditating, is one of the most important mudras that promote physical and mental health. From Sanskrit, chin (or cin) means "consciousness" and mudra means "gesture" or "seal." Therefore, gyan mudra may be translated to mean "gesture of consciousness" in English. Not the answer you're looking for? Browse other questions tagged shiva yoga vivekananda ramakrishna mudra .